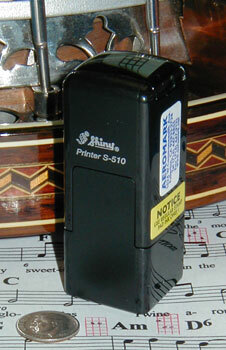 These easy to use self-inking rubber stamps mark sheet music fast. 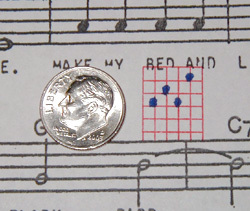 Mark chords for 4 or 6 string fretted instruments like banjo, ukulele & guitar. 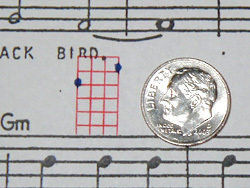 Notation can be added making the top bar the nut or any fret desired, open strings can be marked with a zero. The above impression is larger than actual size. Red ink allows black or blue pen marks to show up easily. 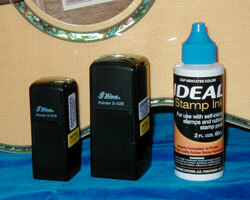 Stamps can be ordered with black or blue ink as well. Each stamp comes with a dust cover so that it can go where you go without making a mess. 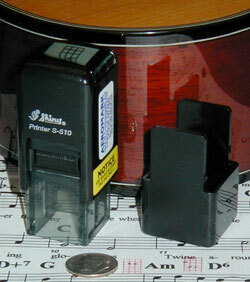 Fits easily in an instrument case or pocket. 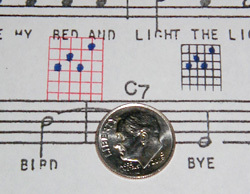 Two sizes are available, one larger and easier to read & mark, the other is made smaller and easier to fit in tight spaces on sheet music. PLEASE NOTE: The prices on this page are special internet only prices. Web orders save us time and that is what allows the deep discounts seen here. We do take phone orders but the prices will be the regular retail prices. PayPal is not setup to add shipping charges to international orders at this time. There are two ways around this. 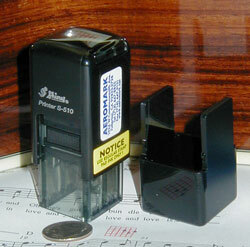 First, you can send us an email <aerostamps@aol.com> requesting a shipping quotation to your country. We will reply with the shipping amount. You can also just run the order through PayPal and we will send the shipping amount to the email address listed on your PayPal account or to any other you direct us to by note. In both cases, international customers can order off the website and make the shipping payment as a separate payment to <hudson29@aol.com>. It is a two step process, but really pretty easy. 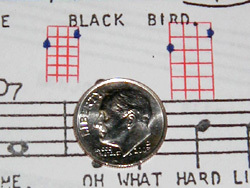 Small 4 String Fret Stamp $11.00 ea. 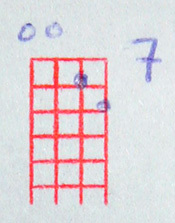 Small 6 String Fret Stamp $11.00 ea. 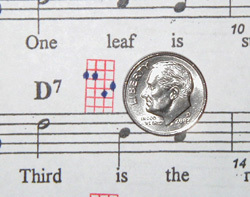 Large 4 String Fret Stamp $13.00 ea. 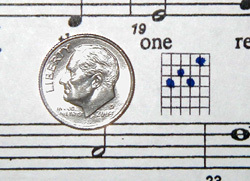 Large 6 String Fret Stamp $13.00 ea. 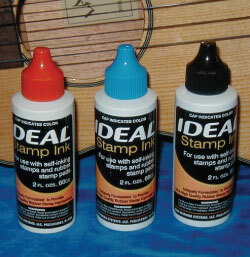 Ideal Ink for Fret Stamps, 2 oz bottle $3.95 ea. 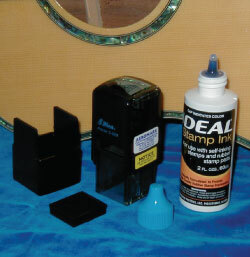 THE DEAL - Buy Both Sizes of 4 String Fret Stamps & Save $5.45! 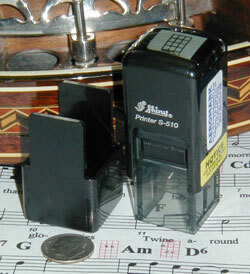 Both Small & Large 4 String Fret Stamps & Refill Ink $22.50 ea. 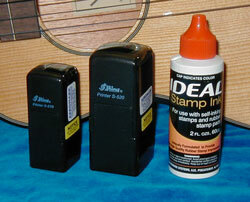 THE DEAL - Buy Both Sizes of 6 String Fret Stamps & Save $5.45! 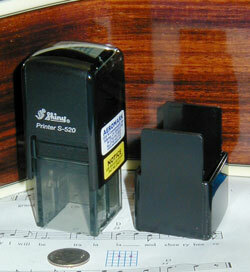 Both Small & Large 6 String Fret Stamps & Refill Ink $22.50 ea. Shipping Charges Within the U.S.A.